Home » Health » What Is Pharyngitis? Pharyngitis is inflammation of the pharynx, which is one of the organs in the throat that connects the back of the nose to the back of the mouth. In this condition, the throat will feel itchy and difficult to swallow. Most cases of pharyngitis are caused by viruses, and some other cases are caused by bacteria, such as group A streptococcus bacteria. Pharyngitis due to viruses or bacteria can spread to other people. These spreads can occur through the air (eg inhaling saliva or nasal secretions issued by the patient) or through objects that have been contaminated by viruses and bacteria. Pharyngitis because the virus is more susceptible to spread if someone is with pharyngitis patients in one room with poor ventilation. While pharyngitis because bacteria can spread rapidly in the neighborhood or workplace in the transition season. Pharyngistic diseases generally recover within 3 to 7 days. Handling can be done through self-medication at home or medication from a doctor. Are You Know : What Is Diphteria? Pharyngitis or sore throat can be caused by several things. Two of them are viruses and bacteria. Some types of viruses that trigger pharyngitis are mumps ( mumps ), Epstein-Barr virus ( monocleosis ), parainfluenza virus, and herpangina virus. While the types of bacteria that can cause pharyngitis are group A beta-hemolytic streptococcus bacteria. This bacterium usually triggers a sore throat (strep throat). Other bacteria are bacteria that cause sexually transmitted infections, such as gonorrhea and chlamydia. Often suffer from flu or runny nose. Often exposed to cigarette smoke in a closed place (passive smoking). The doctor can suspect a patient has pharyngitis based on the symptoms he feels, supported by the results of a physical examination. On a physical examination, the doctor will see if there is swelling or redness in the patient's throat. In addition, the doctor will also check the condition of the ears and nose, and the side of the neck to see if there are enlarged glands. To find out the cause of pharyngitis, the doctor needs to do a follow-up examination. One of them is bacterial culture from the sample throat patient's secretion to test for the presence of Streptococcus bacteria . This sampling is done by technical swab or swab. In addition to these tests, blood tests (including complete blood counts) can also be done to determine the cause of pharyngitis. If the cause is unknown, the doctor can scan with a CT scan to see a picture of the throat and neck condition in more detail. Take over-the-counter pain relievers, such as paracetamol and ibuprofen, to relieve sore throats. Use air humidifier in the room. Eating warm broth or cold drinks. Take throat lozenges to relieve sore throat. If the cause of pharyngitis is a bacterial infection, the doctor will prescribe antibiotic drugs such as penicillin , amoxicillin , erythromycin, or azithromycin , which can destroy the bacteria. The duration of antibiotic use recommended in this case is usually 10 days. Patients need to spend antibiotics so that the infection does not recur and prevent the occurrence of more severe complications. Pharyngitis generally can recover within 3 to 7 days. Even so, be aware that if the symptoms do not show signs of recovery within a week, a fever that reaches a temperature of more than 38 degrees Celsius for several days and does not subside even after taking the medication, sore throat does not heal even after taking painkillers, the sufferer has weak immune system due to illness or drug use, difficulty swallowing until unable to eat or drink, difficulty breathing through the mouth, issuing sounds that interfere with breathing, or drooling continuously. Consultation with a doctor is very necessary because it is feared that it is a symptom of other more severe conditions. Rheumatic fever that can interfere with the heart valve. Kidney disorders or glomerulonephritis . 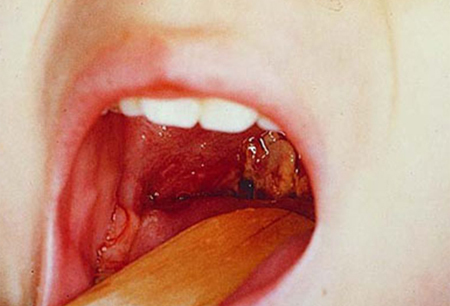 Abscesses on tonsils or other tissues in the throat. Wash your hands frequently, especially before eating or after coughing and sneezing. Use an alcohol-based cleaner if there is no water and soap. Do not share utensils, drink or bathe with pharyngitis sufferers. Avoid contact with pharyngitis patients. 0 Response to "What Is Pharyngitis?"